This is a good basic stock to keep in the freezer to use as a base for other soups, as a flavor base for sauces, or to use on it’s own. All the babies in our family were brought up with Pastina in Brodo, and one of my family’s favorite soups is Tortellini in Brodo. By having a good homemade stock on hand you can put together a meal in mere minutes. I make this broth every other week or so and freeze it in 2 cup sized containers to use when needed. Simmer it slowly to prevent cloudiness. 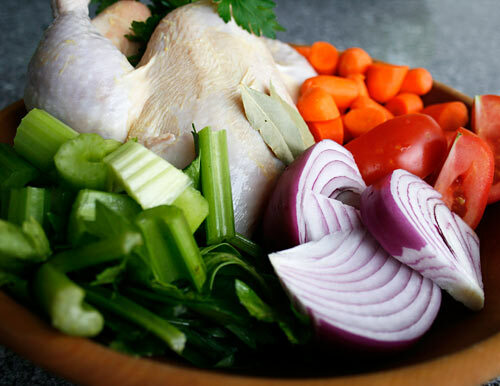 To create a richer, darker broth, you can also roast the chicken in pieces in the oven first before simmering. Preparing your own chicken stock at home allows you to keep the sodium levels low, and to remove any fat that rises to the top. A good basic recipe for chicken stock. Combine all ingredients in a large stock pot, just cover with water and simmer on low for about 3 hours. Periodically, as the soup simmers, skim off the foam with a ladle. Drain the broth from the other ingredients, and strain the broth through cheesecloth. Taste, and season with more salt and pepper as needed.